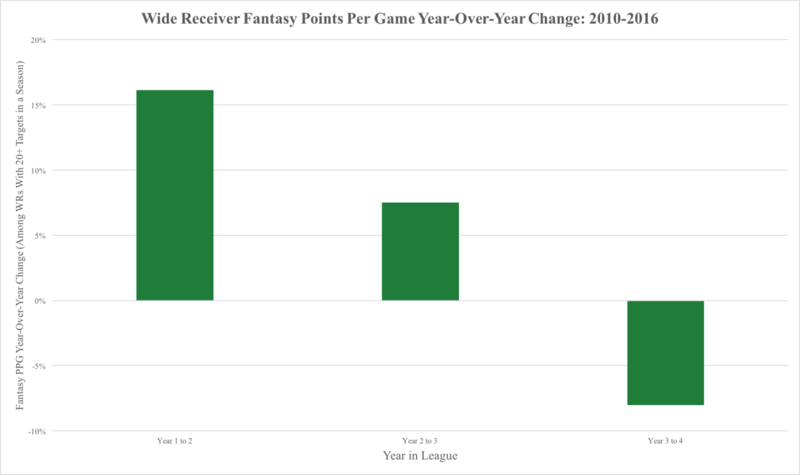 Over the years the popularity of targeting third-year wide receivers has grown immensely in fantasy football, and on the surface there is plenty of data to support the strategy. Year 3 for a wideout is when they are expected to take the next step in their game. The best value to get on a player is getting him the year he actually breaks out rather than a year later. From 2005 to 2014, there were 254 wide receivers who were drafted or signed as undrafted free agents. Of the ones who produced 150 or more fantasy points in their third season, 26 percent of them accomplished the feat while increasing their production from their second year by more than 50 percent. Still, this data doesn’t tell the whole story. In recent years, we’ve seen wide receivers step up their game even earlier in their careers. Tyler Loecher put together some nice data earlier this offseason here at PFF that showed that, from 2010 to 2016, second-year wide receivers dominated target opportunities. In the end, he concluded that even though these players continued to make gains in year three, the increase in production was not as significant as they enjoyed during their second seasons. Thomas already had a breakout rookie campaign as he finished tied for sixth in the league with receiving touchdowns (9) and ninth in both receptions (92) and receiving yards (1,138). His 6-foot-3, 212-pound frame proved to be useful in the red zone, and he reportedly added on 10 pounds of muscle this offseason. His size also helped in his after-the-catch production, where he had 20 tackles either broken or avoided, which was the fourth-best mark out of 114 qualifying WRs. In addition, Thomas delivered 5.2 YAC.